Maybe you’re not super into text marketing, but still want to give mobile communication a try. Let’s say you’re the head of marketing at your church. You’re trying to think of innovative, out of the box ways to reach the congregation, but don’t want to seem invasive or damage your member engagement. What’s the solution? Partner up with our group texting service. We give you all the tools you need to succeed. Sure, text messaging may very well simplify the communication process within your religious organization. But, let’s take it one step further. Can you actually grow your church with our group texting service? Although this might sound like a very long winded explanation, the answer is quite simple. 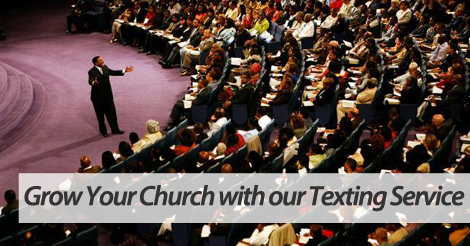 Using our service, you can easily keep your congregation in the loop about important events and weekly reminders. For example, let’s say every Wednesday you hold a men’s small group gathering. Before taking advantage of text communication, you usually only have 5-7 men show up. This isn’t because others haven’t expressed interest; but instead, a handful of potential attendees completely forget to show the night of the event. How do you solve this problem? On Wednesday around 1PM, you fire out a message that reads something like this: Don’t forget about our men’s small group tonight! Bring your bible, refreshments provided. We meet in East Hall at 6PM. This message helps you bring in more attendees, as it acts as a simple, yet friendly reminder. This is just one of many examples that prove a group texting service can help you grow your church. Join forces with our innovative group texting service today. Give us a buzz at 1.800.688.6290, or head over to our pricing page and sign up for a free plan. Our feature rich platform empowers even the newest SMS user to succeed.